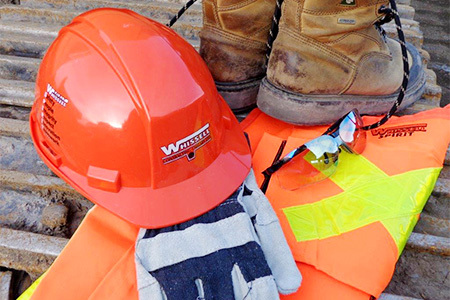 Health, Safety and Environment - Whissell Contracting Ltd.
As one of the first Contractors to develop a safety program (1989), Whissell is considered an industry leader in safety. We operate a comprehensive and well documented safety program that is continuously improved with a focus on being proactive. Our program undergoes both internal and external auditing. External audits are performed by peers from within our industry through the Partners in Injury Reduction (PIR) program. We have maintained a PIR Certificate of Recognition since the program’s inception in 1991. An integral part of our safety program is training. We address job specific safety instruction with training in Prime Contractor, First Aid, Leadership for Safety Excellence, WHMIS, Flag Person Training, Confined Space Awareness, Trenching and Excavations, Principles of Health and Safety Management, Roadbuilders Safety Training System and Dangerous Goods Transportation. Project specific safety is addressed with pre-startup hazard assessments and ongoing “tool box” meetings to assess changes in site safety. From an equipment standpoint, we utilize a preventative maintenance program to reduce equipment failures and their potential for accidents. We endorse a drug and alcohol free work environment.